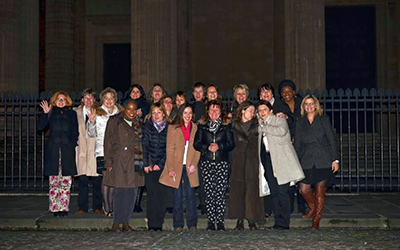 On February 13, Joëlle Castro, Mobilitas-AGS Executive Director, met her partners from the Femmes Chef d’Entreprises (FCE) – an association for businesswomen – for a fantastic city tour in Paris. In order to roam the capital’s streets, the twenty businesswomen used no ‘Vélib’ (a Parisian rental bike) nor ‘Bateaux Mouches’ (famous excursions boats), but rather a fitted out bus provided by the Stan & Walter company. This night trip contributed to relax the atmosphere, by traveling from the Porte Maillot to the Panthéon, and to the Place de la Concorde. Being away from their usual professional environment, they enjoyed cocktails, refreshments and live music, while sharing the challenges they are used to facing. The next event was scheduled in March. The FCE’s membership – with Joëlle Castro having been unanimously appointed Vice President – met over a conference debate given by Cynthia Fleury. This philosopher and psychoanalyst spoke about courage, a notion that all these businesswomen are familiar with.